Aged birch wood is the ultimate in rustic style, and we've capture the look perfectly on this ruggedly romantic wedding invitation. Your wording is printed against a peeled bark design. Strips of birch bark border your wedding details. Your wording is printed in your choice of colors and fonts. Invitation includes outer envelopes. Matching enclosures are printed on non-folding cards and are sold separately. Personalization Options: Design prints as shown. Your wording is printed in your choice of colors and fonts. My fiance and I are so happy we found your website! We are a very laid back country couple and bcuz I ADORE white birch trees, these invitations were perfect. I highly recommend this company. You won't be disappointed! Just what i wanted! I loved it! I highly recommend this web site! Its fast and have an excellent customer service, i called after i did the order and they fix it for me right away! I received exactly on time and they were the most beautiful invitations. I received so many comments because they were different. With the additional coating that I had placed on them, they turned out so elegant. I had a wedding by the lake and they were perfect for the occasion. The card stock was very thick as well. They were well worth the money. These invites are so cute. I love how it allows you to personalize them to whatever you would like them to say and what color you would like them to be. I loved the invites and response cards and the envelopes. There were so many choices on font and they turned out amazing. The price was excellent. Loved everything about the invitations and response cards!! So perfect for our little country church wedding! I wasn't as excited about this style as my groom & his whole family were, but I decided this wasn't the hill I wanted to die on, so I acquiesced and ordered them. They are so adorable! 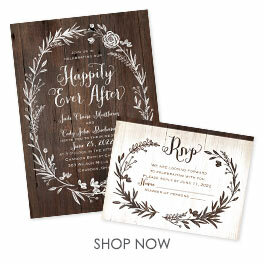 The birch look and the "Giddy Up" font are perfect for our little country church wedding this fall! We got married in a private ceremony with the reception months later. So these were an announcement and invite in one! Love being able to customize them to what we needed! They were perfect! And very fast! I had a great experience. I had all my questions answered and the changes applied to the invites. They had the cards made within 3 days and on my door step 5 days later. I was a lot faster than I thought due to ordering over 700 cards with envelopes. My invitations and Response cards are BEAUTIFUL!!!! Great service,fast shipping, reasonably priced!! Also got my toasting flutes and serving utensils that match the birch tree look! They're beautiful!!! Love our invitations. They fit our personality and style perfectly. Had complications with the promo code, but they were able to help me with no hassles and I was able to get my discount. Thank you for making it so easy. The end result was really well done and there were no mistakes. The whole process was really easy to do. Only thing was I thought they were going to be bigger but still very nice. Amazing love the detail and how easy it was to make our own and simple step by step instructions. ..oh very fast delivery to Canada... it was 5 days from ordering till it got to our door.. The invitations looked great! We were very satisfied! And the price was amazing! This invitation was just as it was described. We ordered the Aged Birch Petite Invitation for our daughter's wedding invitations. The personalization gave us plenty of options and it turned out beautifully. The cost was reasonable and we were pleased with how quickly they arrived.